As regular readers will know, I can’t resist a brownie. I have many recipes for them on the blog, but there are still so many to try. These black velvet cheesecake swirl brownies with stout caramel sauce were the happy result of two events fortuitously coinciding. It was a no brainer; I had to make them. The third event, is of course We Should Cocoa, the blogger’s monthly, “we need chocolate”. It’s rare for me to get my hands on a Waitrose Magazine, so on the odd occasions I do, it’s a real treat. I managed to get a copy of the February edition last month and there, screaming at me, was a recipe for black velvet brownies. They had my name written all over them. At the very same time CT’s nephew turned up with a some bottles of hand-crafted ale – unfiltered and unpasturised. He’s in the lucky position of being head brewer at Gloucester Brewery – a fine job if you like good beer. The recipe required stout, a rather unusual ingredient for brownies that intrigued me. It turned out that one of the ales, Dockside Dark, was a stout-like beer that had notes of coffee and chocolate with a subtle sweetness. I’m not much of a beer drinker, but I did try a mouthful and it was rather good. 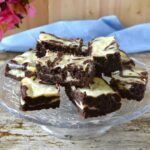 Perfect, as it turned out, for these black velvet cheesecake swirl brownies. It also made a mighty fine stout caramel sauce, which has to be tasted to be properly appreciated. The black velvet cheesecake swirl brownies were sublime. I changed the recipe a little and used a few different ingredients. Like most brownies, they are very sweet, but the stout ameliorated the sweetness to some extent. The creamy cheesecake swirl made a great foil to the robust earthiness of the stout. I wasn’t going to make the caramel sauce to begin with, but on second thoughts it seemed a good way to use up the remaining stout. I’m so glad I did as not only was the stout caramel sauce delicious in its own right, but it adds an extra and welcome dimension to the brownies. It tastes deep and rich with bitter tones, but also nutty notes which I wasn’t expecting. These black velvet cheesecake swirl brownies with stout caramel sauce are truly decadent. They are rich and dark with plenty of chocolate. It turned out, stout wasn’t the only unusual ingredient, rye flour is included too. They’d make a fantastic afternoon tea treat or dessert for a dinner party, especially served slightly warm with hot sauce. The day after baking, the brownies had reached their peak, displaying a fudgy consistency which was quite irresistible. 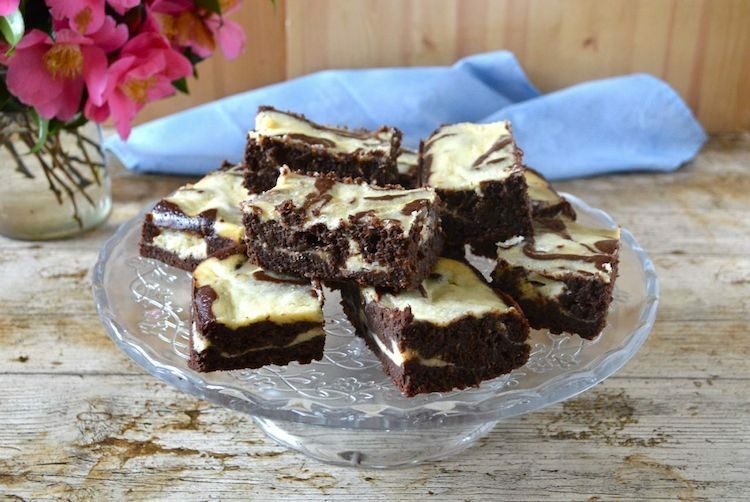 Deep, dark and rich, these black velvet cheesecake swirl brownies are best suited to adults. They make an excellent dessert, especially when served with stout caramel sauce. Place the stout, chocolate and butter in a large pan over a low heat . Stir until everything is melted. Remove from the heat and stir in the sugar until dissolved. Beat in the eggs one by one, then sift in the flours, cocoa and baking powder and stir until just combined. Grease or line a 23 cm (9") sq. cake tin. I use a silicone mould, so I don't need to line it. Pour half of the batter into the tin. Beat everything together until just combined. Spoon half of the mixture over the brownie batter. Spoon the remaining brownie batter over the cheesecake and then spoon over the remaining cheesecake. Using a knife, swirl the mixture a few times to create a marble effect. Bake in a pre-heated oven at 180C for 30 minutes or until the top is just firm. Place the tin on a wire rack and leave to cool completely. Cut the bake into 12-16 pieces and serve with some of the stout caramel sauce. Pour the stout into a pan and place over a medium heat. Add the sugars and stir until dissolved. Bring to the boil and leave until the mixture has reduced by about half. Stir in the chocolate, cream and salt and simmer for another minute or so. These black velvet cheesecake swirl brownies with stout caramel sauce are my entry to this month’s #WeShouldCocoa. There is a lot of dark chocolate in the brownies and some in the sauce too. I really love stout or porter beers in chocolate recipes, Pete has baked some tasty treats. These look superb, love that drizzled sauce on top. The sauce is so much nicer than I thought it would be Kavey. The stout definitely took everything to a new level. Well yes, working for the council doesn’t sound quite as romantic, but the silver lining is, it’s probably better paid. It sounds like you absolutely have to make him a batch and don’t forget the sauce. Those look wonderful Choclette. I’ve made cheesecake brownies before and they were really good. I love that you elevate yours to luxurious dessert with the caramel sauce. Thanks Jac. I’ve made cheesecake brownies before and they are good, but these stout ones definitely take them up a notch. I’ve always wondered what the taste of stout is like with chocolate with three men in my house this would be perfect! Cheesecake and brownies.. two most divine desserts in one. Heavenly! Hahaha, I know exactly what you mean. My willpower isn’t great when it comes to brownies. Best made for a party really. These do look amazing, I wish I was better at baking but for now I’ll drool over your blog posts! Thanks. If you’re not a confident baker, brownies are an excellent place to start. They really are quite simple to put together. oh they looks superb… it’s been such a while since either of us have baked brownies and these are such a good place to kick off from… love how complex in flavour they look and how pretty the swirls are… nice work my friend! O sounds like a wonderful decadent treat! Yes, I had to try it as soon as I saw it. I’m sure you’ll come up with a good vegan version. It works particularly well with these brownies.